As Toyota and Hyundai hope,Hydrogen power is one possible future for cars. Certainly greater fuel economy will be part of forthcoming automotives. Will they also be extremely low to the ground and resemble a cartoon nose or phallic symbol? Well hey, we couldn't rule it out. What's for certain is that Shell's Eco-Marathon is coming to London in 2016, with one of the British entrants being the black car in the line-up above, and it does the equivalent of around 430 miles per litre of fuel. That's about 1,954mpg, by our calculations. Pictured here with driver Dhruv Singh, theHydrone AB2 car entered in the 2015 Shell Eco-marathon Europe. The idea of the Eco-marathon is that it challenges students to design the vehicle that can go the furthest on one litre of fuel. As Hydrone AB2 runs on hydrogen, complex calculations are used to work out how much of it is equivalent to a litre of petrol. Designed by a team of five Mechanical Engineering studentsfrom University College London, Hydrone AB2 went from drawing board to track in less than a year. The team's intention is to push its economy to achieve 1,000 to 1,500km on the same amount of fuel in next year's competition. Hydrone AB2 runs on a 1.1kW open-loop proton exchange membrane (PEM) fuel cell with a rated voltage of 25-48V. The fuel cell drives a hub motor of similar power rating and excess power is routed to a supercapacitor bank. Dhruv steers with his feet, while the throttle and brake are hand levers. The chassis is a mix of carbon composite and 3D-printed parts, with the main window kept in place using small magnets. Clearly the shape and light weight of the car are also essential to ekeing out the greatest possible distance on a tiny quantity of fuel. 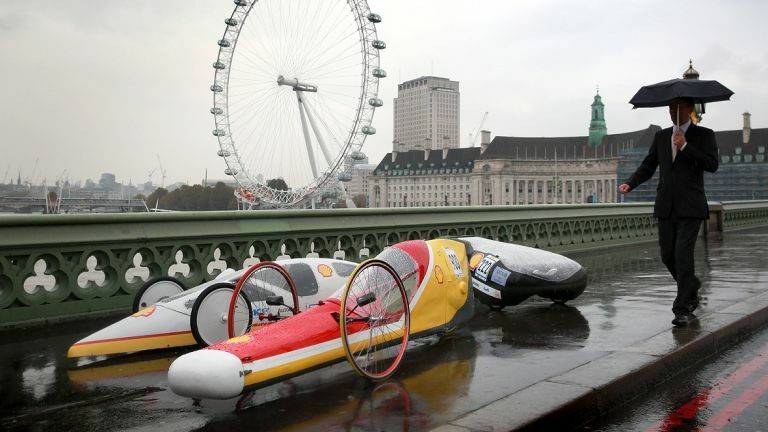 Now in its 30th year (the cars pictured above wth Hydrone AB2 are legendary previous competitors), the Shell Eco-marathon willcome to London for the first time in 2016, when hundreds of teams will compete at Queen Elizabeth Olympic Park from June 30 to July 3. A word of warning: this is likely to be one of the more boring 'races' you've ever clapped eyes on, as the goal is to go long, not fast.And with the current Eco-marathon record being a ridiculous 2,343 miles - enough to get to Rome and back, and the equivalent of10,652mpg- it's likely to be a very long 'race', too. Mayor of London, Boris Johnson MP, said, whilst stood on a plinth having custard pies thrown at him, “I am thrilled to welcome the world's best science and tech innovators to London as they strive to make motor vehicles more and more energy efficient - saving carbon and reducing air pollution." Donning a clown suit and abseiling down the side of the London Assembly Building, Johnson added “London is home to the best designers, engineers and entrepreneurs who I know will rise to the challenge of developing the transformational low energy cars of the future." He then didn't add, "Oof! I say you chaps, steady on! Yarrrroo!” But he probably wanted to.